Commemorative coinage plays an important part in American numismatics, highlighting the people, places, and events that shaped the country. The classic commemorative coins struck between 1892 and 1954 feature a wide array of creative and sometimes enigmatic designs not found elsewhere within the nation’s coinage. These coins were struck in silver or gold across a range of different denominations. Among the vast array of issues are the 1915-S Panama Pacific $50 Gold Pieces, which stand apart for their size, shape, beauty, and extremely limited mintage. These coins were issued together with a silver half dollar, one dollar gold piece, and 2 ½ dollar gold piece, to mark the 1915 Panama Pacific Exposition. The Panama Pacific Exposition was a world’s fair held in San Francisco from late February to early December 1915. The purpose of the fair was to celebrate the completion of the Panama Canal, but it was also seen as an opportunity for the city to showcase its recovery from the devastating earthquake of 1906 and subsequent fire. The exposition would serve to reinforce San Francisco’s status as one of the leading cities in the world. Highlights of the exposition included the Liberty bell, which was moved from Philadelphia for the occasion, the last time it would leave that city. A phone line was laid from New York to San Francisco, so that the residents of the former city could hear the Pacific Ocean. The grounds where the exposition took place are now called “The Marina” although all of the original buildings of the exposition have been broken down. The so-called “Tower of Jewels”, which was covered with glass “novagems” in various colors, was rebuilt in the 1960s and still stands to this day. Replicas of these novagems were sold as souvenirs at the exposition with some of them having become highly collectable. 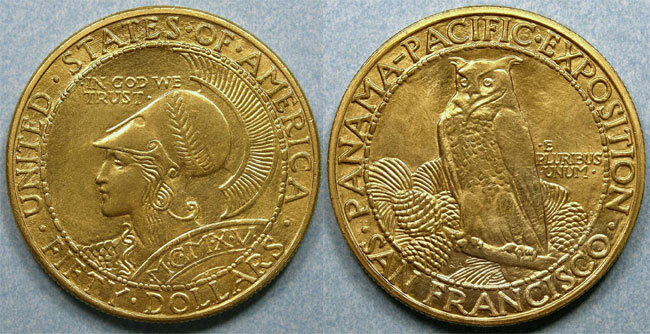 The Panama Pacific $50 Gold Pieces were the first $50 gold coins issued by the Federal government. While such a coinage had been proposed in the 19th century, it was never produced and the only $50 gold pieces that had circulated in the United States where privately struck pieces that circulated in gold-rush California in the 1850’s (which were authorized by law but issued by Augustus Humbert). One of the Panama Pacific $50 Gold Coins was octagonal, the first and only United States coin issued by a federal Mint that has held this distinction. 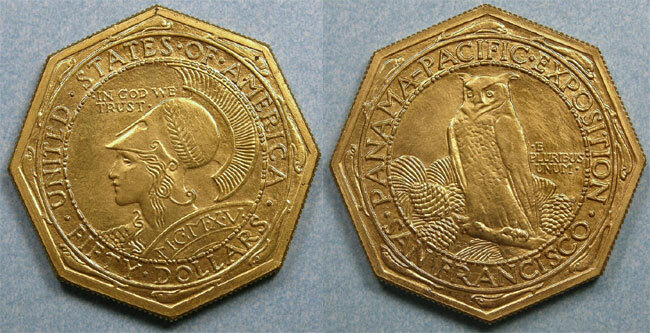 The Panama Pacific $50 Gold Pieces were issued in two different versions, round and octagonal. Both shared essentially the same design by Robert Aitken. The obverse featured the goddess Minerva while the reverse had an owl (presumably sacred to Minerva). It is obvious that Aitken was inspired by ancient coinage as both Minerva and the Owl, as well as the dolphins on the octagonal $50 gold piece, originated from there (Minerva was Roman while the owl and dolphins are often seen on Greek coinage). The coins were struck in small quantities at the San Francisco Mint: 1,510 of the round design were struck while only 1,509 of the octagonal design were produced. These mintages, however, were very optimistic as those numbers were not even close to the quantities sold at the exposition. Of the round version, a total of 1,015 pieces remained unsold after the exposition, leaving a net mintage of 483 coins. This makes the $50 round gold piece the lowest mintage 20th century coin issued by the United States Mint. The $50 octagonal gold piece was slightly more popular, with a total 645 pieces remaining after 865 pieces (including 10 set aside for assay purposes) had been melted in 1916. Despite the mintage variance, both issues are considered rare. The visitor to the exposition was given multiple options for purchasing the commemorative coins. The lower denominations were all available for sale individually within small envelopes. The $50 gold pieces were available individually for $100 each. A boxed set containing all of the smaller coins and a choice of the $50 gold piece was also offered. As can be concluded from the number of pieces sold, more purchasers choose the octagonal piece for inclusion in those sets. A complete set was also offered, containing both versions and carrying a total face value of $104, which sold at the exposition for $200. Purple velvet frames were also available to display the coins, and these frames have become highly collectable over the years. Because the 1915 Panama Pacific $50 Gold Coins sold for a strong premium at the exposition and were not intended for circulation, nearly all surviving specimens are in uncirculated condition. A few are found in AU condition, which usually is the result of cabinet friction. Because it was common to clean coins until later in the 20th century, some pieces come with cleaned, dull surfaces. While these occasionally offer a somewhat affordable option, they are best avoided by serious collectors. Despite their rarity these $50 gold pieces are offered for sale somewhat frequently due to the high survival rate. The finest known round $50 gold pieces include one example graded PCGS MS-66 and a single NGC MS-67 (NGC has also graded two pieces at the MS-66 level). The NGC MS-67 is part of a complete set which was bought during the exposition by a collector in Kansas. All paperwork is still present and without doubt this is one of the most valuable items that are still available from the Panama-Pacific Exposition. The value of the set (which also includes high grade examples of the other coins) is well over half a million dollars. As for the single coins, one of the NGC MS-66’s sold for $172,500 in August 2006. The octagonal $50 gold piece, perhaps unsurprisingly due to the demand for it at the time, is slightly more common in high grade. Four NGC MS-67 pieces have been graded, while PCGS has only graded a single example at MS-66. One of the NGC MS-67’s sold for a whopping $207,000 in January 2009. The Kansas set, which was mentioned above, includes a MS-65 example of this issue. It should not come as a surprise that none of these $50 gold pieces come cheap. A lower grade uncirculated example of either version will cost a minimum of $50,000 with the price going up from there. As an example a MS-64 will usually cost over $100,000. A minimum cost of $30,000 should be expected for even a cleaned, dull example, which as previously mentioned should be avoided. Full sets of the 1915-S commemorative coinage are highly collectable as well, especially if they include the original paperwork, tracing them back to the actual exposition. The velvet purple frames are highly collectible as well. One of the more common frames sold for $2,000 at auction in August 2010. That particular frames had space for all the commemorative coins including both $50 gold pieces. Other frames exclude the $50 gold pieces while a very rare variety has two spaces for each of the coins, showing both obverse as well as the reverse, a very expensive endeavor to complete.